Isn’t it nice when political parties involve their members? Get them active and communicate effectively? Always a positive thing. 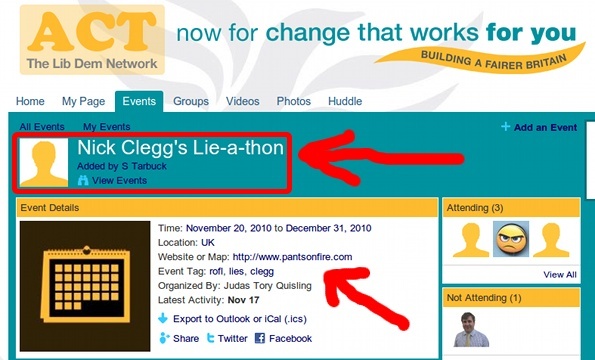 So it’s nice that the Liberal Democrats are doing that with their ACT site. The site, which you can link to here should you really want to, allows members/supporters/activists to add events such as campaign days, socials, and so on to it. Which is lovely and Labour do a similar thing on their membersnet pages. The difference is the Labour site requires a login which only members can get. With the Liberal Demoservatives, anyone can add an event. So you can just imagine the events that have been added. And if you can’t imagine such a thing, here’s a picture for you as a handy aide imaginaire.